Today I had a new experience; I flew around the Earth! 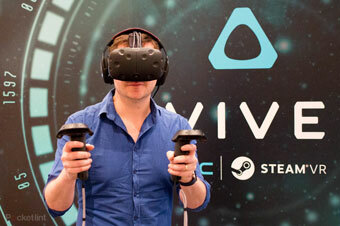 My ship was an HTC Vive. I was able to fly around, zoom in and out, and even see population statistics and social media traffic superimposed over the globe. It was seamless 1080p at 90fps, and I was there. I didn't feel sick or scared, I felt liberated and elated. And I can't wait for my next flight! For the to-learn list ... Unity. 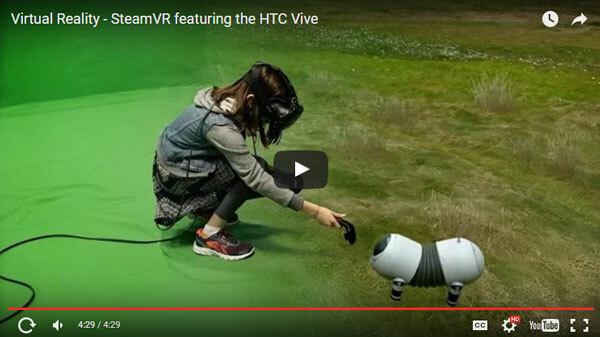 [Apparently, one of] the easiest / best ways to develop VR content for Vives, Rifts, and their brethren. 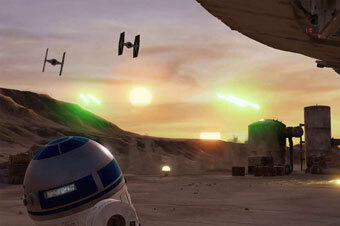 Inside Industrial Light & Magic's virtual reality lab. "Industrial Light & Magic’s Experience Lab (ILMxLAB) is a newly-formed supergroup of artists, engineers, sound designers, and storytellers prototyping the future of interactive, immersive cinema for Lucasfilm." Next gen moviemaking. Of course the ILMs of the world will be making VR content, but with the tools now available, there's going to be a democratization and everyone will be able to make VR movies, just like anyone can shoot HD with their phone. It will be all about the destinations and stories. Jeff Immelt of GE counterpunches: Bernie Sanders says we’re ‘destroying the moral fabric’ of America. He’s wrong. "We create wealth and jobs, instead of just calling for them in speeches." Absolutely. John Hindraker considers The Left's new battleground: co-ed bathrooms. "The 'discrimination' consists of the fact that men can’t use women’s rest rooms ... There was a time when, if you had said that one of our major political parties would someday consider it a vital civil right that men be allowed to use women’s bathrooms, people would have thought you were nuts. They would have been right." I can see on the Internets including my Facebook feed that the North Carolina law has attracted the ire of many liberals, protesting this "discrimination". More proof, if any were needed, that Idiocracy was a documentary. All is not lost, however: When Mark Steyn struck back. The rapid decline of conditions in Europe are a cautionary tale for sure. Those who fail to learn the lessons of history current eventsare doomed to repeat them. 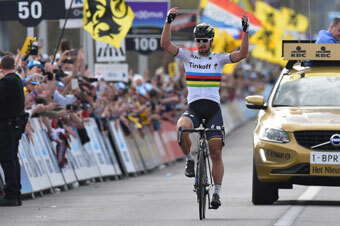 Peter Sagan wins Tour of Flanders, his first monument, but surely not his last. It's not just that he won - while wearing the world champion's rainbow jersey - it's the way he won, riding right away from the field to power to victory. You just don't see that very often in today's peloton. I can't wait for Paris Roubaix next Sunday! Hat tip to Fabian Cancellara, who finished a charging second; he did his best in his final effort (he's announced his retirement), but nobody can catch Sagan when he's on a good day anymore. This is HP's new logo. I like it.